Junior infield Conner Leonard hits homerun against Texas State.The Mountaineers lost in all three games to Texas State with the final scores being 6-3, 7-4, and 2-0. Game One vs. Texas State. Friday at 7 p.m.
Slamming the door shut after nine long innings can be challenging, and the Mountaineers again faced that reality, losing a 3-1 lead in the ninth inning to eventually fall 6-3 to Texas State in extra innings, in the first of the three game series against the Bobcats. App State (10-12, 1-3 Sun Belt) controlled the game for eight innings, playing ahead or tied in the game’s first eight frames. As the Mountaineers headed to the ninth, the Bobcats (14-8, 3-1 Sun Belt) roared back to tie the game at 3-3, sending the Mountaineers into their first extra inning game of the season. After an uneventful 10th inning, the Bobcats put together three hits in the 11th, gaining a 4-3 lead on right fielder Theodore Hoffman’s single. 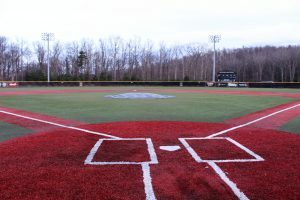 Right after Hoffman’s single, the bases were loaded, and shortstop Luke Sherley drove a double down the left field line, scoring two and extending the lead to 6-3. Junior cathcer Chandler Seagle tags runner going towards home plate to stop Texas State from scoring. 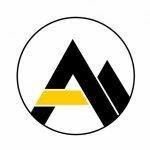 The Mountaineers lost in all three games to Texas State with the final scores being 3-6, 4-7, and 0-2. Striking out the side in the bottom half, pitcher Brayden Theriot earned the save and helped close out the Bobcats first win of the series. Putting together over six solid innings of work on the mound, Mountaineer starting pitcher Travis Holden continually worked out of jams, helping his team hold a 3-1 lead after six. 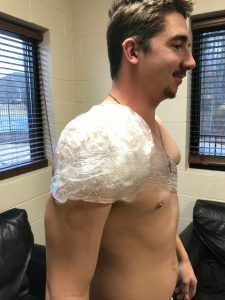 Holding Bobcat batters to only 2/12 with runners in scoring position, Holden found the right pitches to get his teammates back into the dugout. 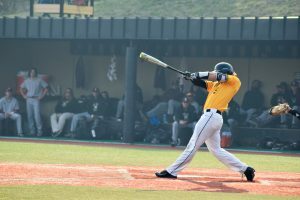 Defense also played a major part into the Apps strong start, where right fielder Brian Bauk gunned down the Bobcat runner at home to end fourth inning. Doubling down the left field line, Bauk helped score catcher Chandler Seagle. Taking a 1-0 lead, the App State lead was short lived, when the Bobcats tied the game up at 1-1 in the top half of the third. Tacking on another run in the sixth, App State extended their lead to 3-1. 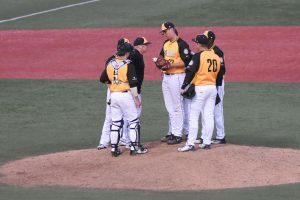 Keeping the Bobcats in check until the ninth, the Apps look for their next opportunity to nail down their second conference victory of the season. App State fell to 0-7 all-time against Texas State and will look to gain their first ever victory over the Bobcats during Saturday’s double header. Game Two vs. Texas State. 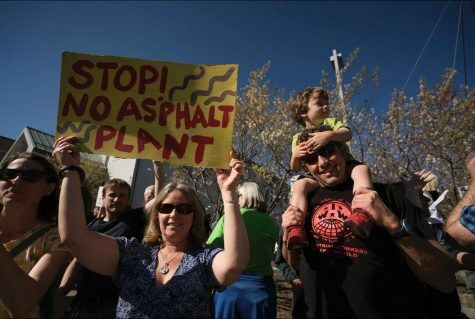 Saturday at 2 p.m. 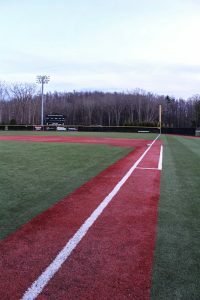 The App State baseball team played Texas State in game two of their Sun Belt matchup on Saturday at Smith Stadium. 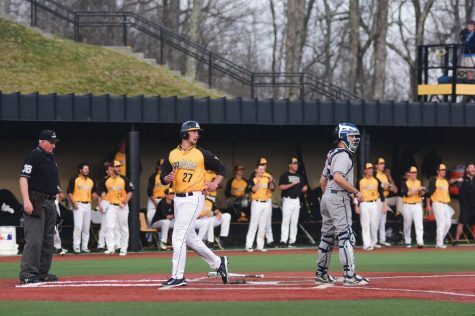 After trailing by three runs late, the Mountaineers fought back to tie the game in the seventh inning, but ultimately fell victim to the Bobcats potent offense, losing 7-4. 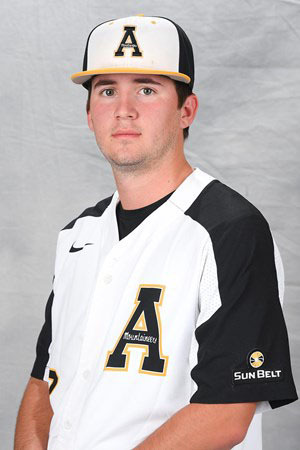 App State (10-13, 1-4 Sun Belt) started sophomore lefthander Colin Schmid (3-2, 2.45 ERA) on the mound. The Mountaineers started out strong, allowing no hits in the first and getting two runners into scoring position with no outs in the bottom of the same inning. Things started going awry for App State after that. Texas State right fielder Theodore Hoffman homered in the second to score the Bobcats first run. A double in the fourth inning after an infield single and a walk scored them two more, and then a sacrifice fly by Bobcat second baseman Jonathan Ortega shortly after netted them another. All three runs coming with two outs on the scoreboard. 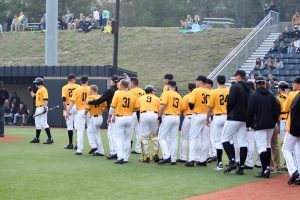 Appalachian State baseball team congratulating Conner Leonard for his homerun. The Mountaineers mounted a comeback late in the game, scoring on a wild pitch and two sacrifice hits, one from Drake Zupcic in the sixth and one from Avery Jackson in the seventh, but just after gaining some momentum, Texas State scored two runs in the eighth after four singles in five at-bats and never looked back. App State’s defensive play was solid throughout, posting no errors and making several impressive stops. Their inability to string together hits or get them in big moments was their downfall. Game Three vs. Texas State. Saturday at 6 p.m. 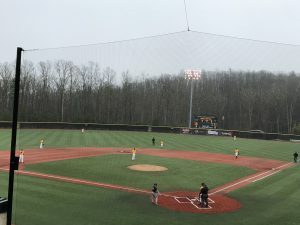 The App State baseball team finished their series with Texas State on Saturday evening with the finale of a doubleheader at Smith Stadium. In a real pitchers duel, only nine total hits were amassed for both teams, compared to 28 and 23 in their first two matches with the Bobcats. The Mountaineers lost a close one, 2-0 to fall 0-9 all-time to the Bobcats. 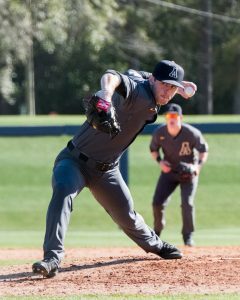 App State (10-14, 1-5 Sun Belt) started right-handed pitcher Luke Watts (1-1, 3.30 ERA) on the hill. His .250 opponents batting average is the best among App State starters. After a pair of singles in the first inning, Watts allowed his first run and Texas State took a one-run lead. After that, Watts was solid, getting out a string of 11 straight batters from the end of the second inning until the top of the sixth inning. Once again, the Mountaineers were unable to get any offense going. Tallying just three hits, with two from first baseman Avery Jackson, App State didn’t get into scoring position until the fourth inning. 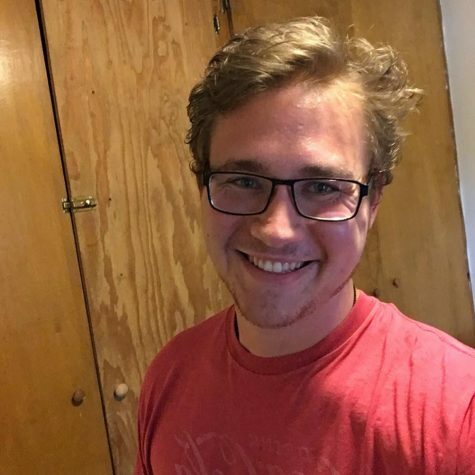 In the sixth, Jackson doubled down the left field line with just one out, but he was followed by two putouts, snuffing out the little life the Mountaineers had created. Luke Watts was pulled during the seventh inning after a good home start. 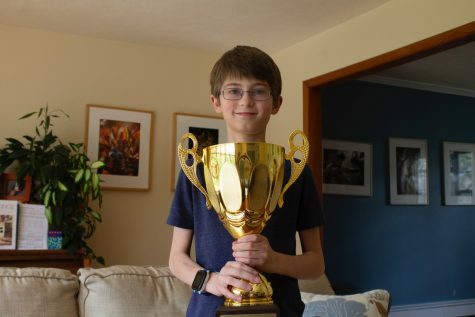 In 6.0 innings pitched, he allowed six hits, struck out six and earned two runs. He was replaced by submarining reliever Tristan Helms, with Sean Mason brought in to finish it out. Junior catcher Chandler Seagle hits double against Texas State. 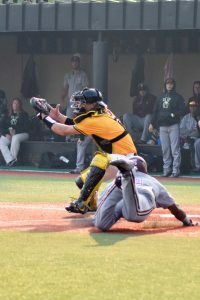 The Mountaineers lost in all three games to Texas State with the final scores being 3-6, 4-7, and 0-2. 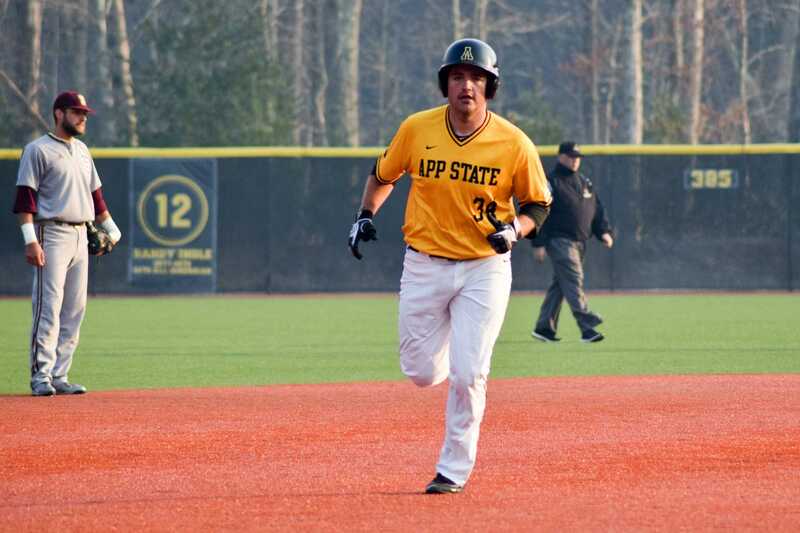 App State got only one runner in scoring position during the final three innings, after outfielder Drake Zupcic was hit by a pitch and then advanced to second base on a passed ball. In the bottom of the ninth, the Mountaineers flew out to the outfield three straight batters to end the game. The Mountaineers will return home on Tuesday to host Wake Forest at 5 p.m.